Ms Anderson is an Alyawarre woman, whose mother was one of the Stolen Generations. Ms Anderson grew up in Parap camp in Darwin, acutely aware from a very young age of the extreme forms of discrimination and racism experienced by Aboriginal people. Ms Anderson is the Chair of the Lowitja Institute and co-chair of the Prime Minister’s Referendum Council. She has worked tirelessly to advance the rights and welfare of Aboriginal and Torres Strait Islander peoples, particularly in regards to education, health, early childhood development, and preventing violence against Aboriginal women and children. Ms Anderson is also motivated by the need to create positive pathways for individuals and communities, based on culture, identity, health and wellbeing. She wants to change the narrative so that Aboriginal and Torres Strait Islander peoples celebrate their successes and have agency and control over their lives. Ms Ozols is a mental health and suicide prevention advocate and educator. She is the founder and managing director of Mental Health at Work, a consultancy focussed on improving our understanding of mental health and building resilience in the workplace. She has developed an online e- learning tool, mh @ work®, to help manage mental health issues in the workplace. This interactive program enables people to share experiences of mental illness and recovery, helping to change attitudes and workplace cultures. More than 200,000 employees have used mh @ work’s education tools and programs. Ms Ozols has contributed to many Australian mental health boards, committees and advisory groups. She was the inaugural Chair of BlueVoices, beyondblue’s consumer arm; and a former board member of the Mental Health Council of Australia. Other memberships and advisory groups include the Royal Australian and New Zealand College Psychiatry and the General Practitioner’s Mental Health Standards Collaboration. Dr Sanggaran is a former Australian immigration detention doctor who risked prosecution under section 42 of the Border Force Act to bring to light human rights abuses within Australian immigration detention. He is the co-author of Christmas Island Doctors of Concern, a 92-page letter signed by 15 doctors who practiced inside immigration detention on Christmas Island. The letter is a comprehensive account of the failings of medical procedure inside detention centres in Australia. Dr Sanggaran has also campaigned extensively for ratification of OPCAT (the Optional Protocol to the Convention Against Torture). He has worked within the medical and health sectors to forge a broad consensus for ratification of the protocol, and organised a petition nearing 10,000 signatures in support of this objective. Mr Adut is a lawyer and advocate for the rights of refugees and other vulnerable citizens. Mr Adut came to Australia as 14-year-old refugee. He had been conscripted as a child soldier in South Sudan when he was six. He never had an opportunity to go to school but he taught himself to read, write and speak English, and he won a scholarship to study law at the University of Western Sydney (UWS). 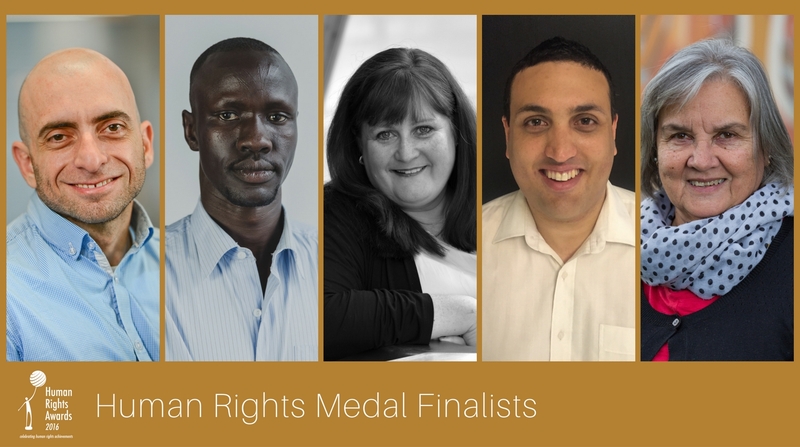 Mr Adut moved won national attention with his 2016 Australia Day address, and won more hearts and minds when a short video telling his life story went viral, attracting over 2.4 million views. He graduated from UWS with a Bachelor of Law in 2010 and went onto establish the AC Law Group in Blacktown with Joseph Correy. Mr Nunnari is a disability advocate and former Paralympic athlete who chairs the City of Sydney Inclusion (Disability) Advisory Panel and is manager of Event Access and Inclusion with the NSW Department of Premier and Cabinet. Mr Nunnari has worked over many years to increase opportunities for people with disability to participate in major and community events across NSW, and he played a key role in plans to make the Sydney Harbour Bridge wheelchair-accessible (expected completion in 2017). Mr Nunnari works directly with event organisers and planning agencies to coordinate strategies such as better transport and communication options, better disability awareness training for event staff, accessible viewing areas, captioning and audio description. He has helped ensure accessibility for major events including Sydney New Year’s Eve, Vivid Sydney, ANZAC Day, the Sydney Gay and Lesbian Mardi Gras parade and the Sydney City to Surf. Since arriving in Australia as a refugee, Arash has worked at the community level volunteering with Settlement Services International and as a youth leader with Auburn Diversity services, alongside international advocacy work with the United Nations High Commissioner for Refugees and at the Asia Pacific Consultation on Refugee Rights. 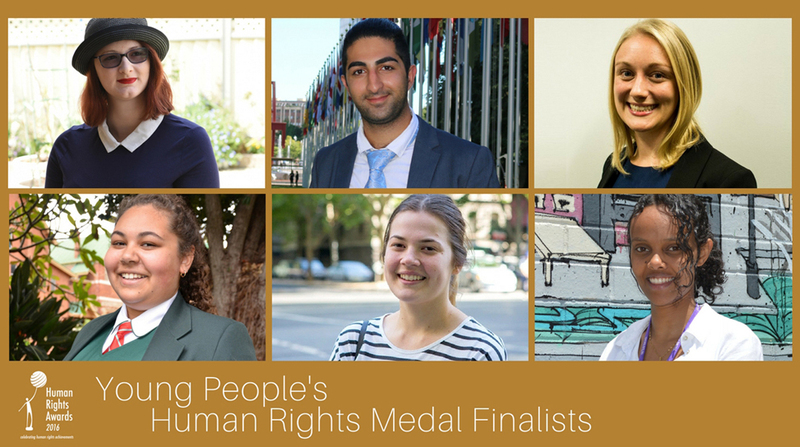 Danikka has raised awareness about a range of human rights issues facing young Australians through her work as part of the Western Australia Youth Leadership Roundtable and as an inaugural youth ambassador for Save the Children Australia. Ella has sought to influence change in business practices that discriminate against people with mental illnesses based on her personal experience challenging a travel insurance policy with a blanket exclusion for all mental illness claims. Madeline founded and leads the One Woman Project, which delivers seminars, conferences and campaigns to young people to raise awareness of issues relating to gender inequality. Kathryn has met with a variety of public and private entities and parliamentarians to increase awareness about the human rights of people with disabilities and the practical ways in which these rights can be respected, protected and promoted. In the last year, Sara coordinated an initiative to equip young people with refugee and migrant backgrounds to share their stories, as well as co-organising the inaugural Catalyst Youth Summit and mentoring a university student every semester. Exposed mistreatment of young people in the Northern Territory detention system. The program broadcast shocking footage of children being tear-gassed, stripped naked and restrained using hoods. Within hours of the footage being broadcast on ABC’s Four Corners program, the Prime Minister had announced a Royal Commission into the detention of children in the Northern Territory. Jess' in-depth feature for The Monthly reveals how the family law system can place children at risk of violence and abuse. Her research documented alarming cases in which parents had been granted custody of their children despite evidence of abuse, while parents who raised allegations of abuse risked having their children removed from their care. Louise's powerful investigation for the ABC’s 7:30 program focused on the mistreatment of young people with disability by institutions tasked with their care and protection. It revealed disturbing evidence of young people being locked up, secluded and abused, including cases in which young people had been held in a lockable box and a student had been left to sit outdoors all day in winter for a whole school term. Published by The Guardian Australia, comprise more than 2,000 leaked incident reports from the Australian-funded regional processing centre in Nauru. The Files revealed several serious allegations of assault and sexual abuse and offered an unprecedented insight into the deleterious impacts of third country processing on the health and wellbeing of people seeking asylum. 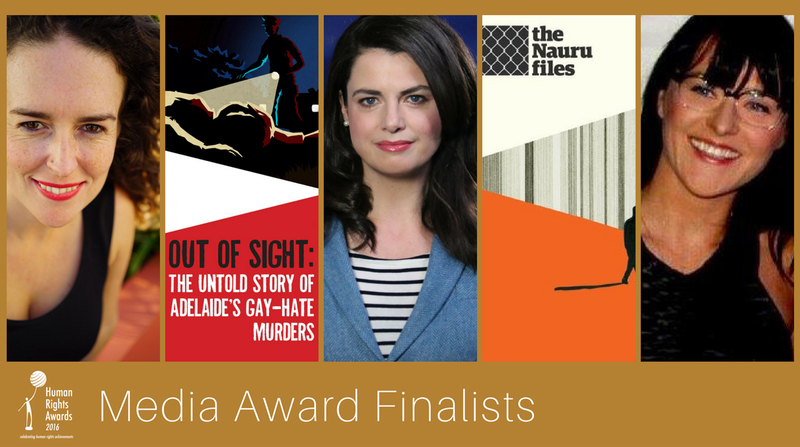 Mark's comprehensive SBS investigation into gay-hate crimes in Adelaide, which shone a light on brutal yet little-known assaults and murders of gay men from the 1970s to recent years. His work exposed the discrimination and homophobia that not only fuelled these crimes, but also allowed the perpetrators to escape punishment. The National Ethnic and Multicultural Broadcasters Council (NEMBC) is the peak organisation of ethnic community broadcasters in Australia. It harnesses the expertise of more than 4000 volunteers from 125 cultural groups to broadcast over 2000 hours of programs each week, in English, Congolese, Punjabi, Farsi, Filipino and other languages. Welcome to Australia is responsible for the Walk Together event, which brings together thousands of people from nearly 30 towns and cities to celebrate diversity and promote compassion and generosity. Welcome to Australia has also devised the Welcoming Cities project, which seeks to address and embrace the challenges and opportunities of migration by working with local government and communities to create more welcoming and inclusive communities. 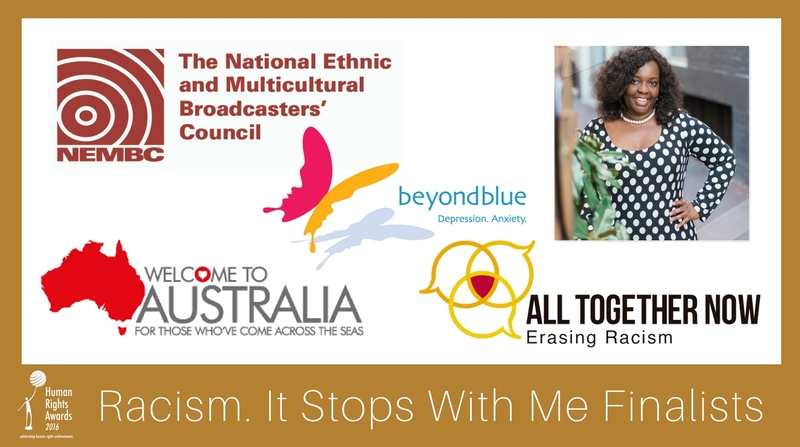 Beyond Blue’s Invisible Discriminator campaign successfully highlighted the impact of insidious, subtle racism and discrimination on the social and emotional wellbeing of Aboriginal and Torres Strait Islander peoples. Using TV commercials and clear and accessible information on mental health and discrimination, Beyond Blue’s campaign focused on the link between racial discrimination and psychological distress. In 2014, All Together Now launched the Everyday Racism mobile phone app, designed to build empathy with people who are the targets of racism. Recently, All Together Now adapted the Everyday Racism app for school students aged 8 to 10. The new app is called Kids Together Now. It allows primary school teachers to take kids through interactive storylines to promote positive relationships. Ms Fadzi Whande campaigns against family violence in CALD communities in Western Australia, working with organisations such as UN Women, White Ribbon and the Humanitarian Group Community Legal Centre. Ms Whande has implemented a program called Courageous Conversations About Race, and is working with the Australian Federal Police, the Department of Immigration and Border Protection and the Department of Corrective Services to address systemic barriers and unconscious bias towards marginalised groups. As Director of Kingsford Legal Centre, Anna Cody has provided high quality case work to thousands of disadvantaged people, as well as advocating for law reform to address systemic human rights breaches. Peter O’Brien has spent many years working as a lawyer and human rights advocate, most recently representing Dylan Voller and Jake Roper in their civil suit against the Northern Territory’s corrective services. A highly respected commercial litigator and solicitor of 25 years, Steven has shown a long-standing commitment to pro bono work and has led the development of Gilbert + Tobin’s pro bono refugee practice. 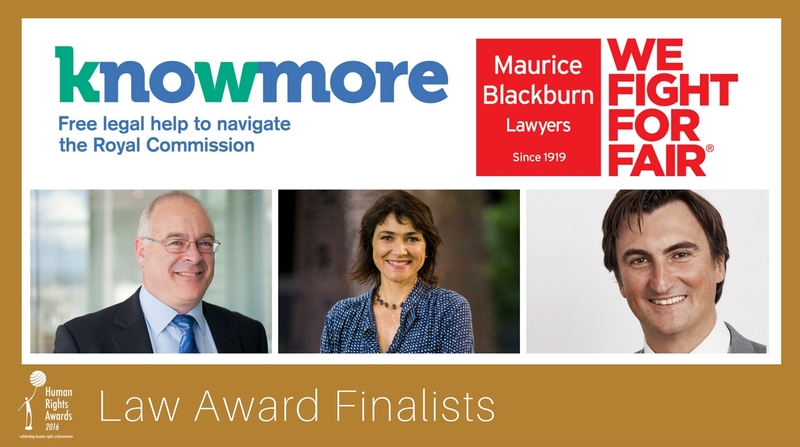 Knowmore is an independent service that gives free legal advice to people considering telling their story to the Royal Commission into Institutional Responses to Child Sexual Abuse. Maurice Blackburn Lawyers has led litigation in the public interest for many years. In 2015 and 2016, Maurice Blackburn conducted several large scale pro bono actions addressing discrimination and human rights issues including those of young people, people with disabilities and people seeking asylum. The Community Organisation Award is awarded to a non-government / community-based organisation with a proven track record in promoting and advancing human rights in the Australian community. For approximately 8 years, Bus Stop Films has provided film studies and film-making opportunities for people with disabilities, as well as advocating for inclusion in the film industry. SHINE for Kids uses innovative approaches to support and protect children who have a parent who has been incarcerated, with the goal of minimising and reducing adverse impact. 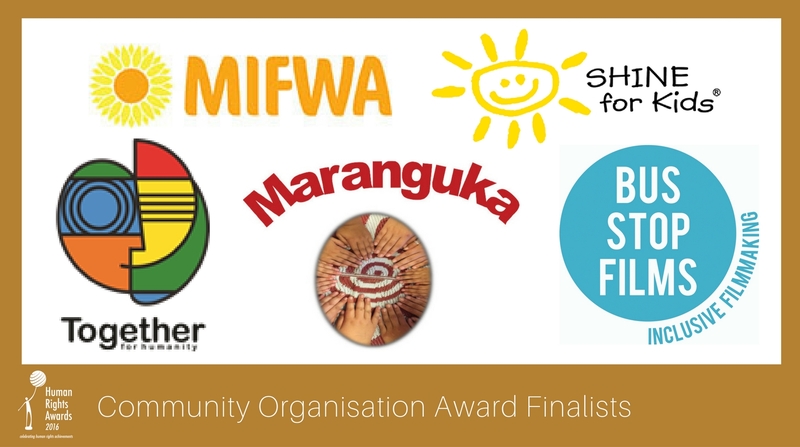 Maranguka works with Aboriginal families that are experiencing very high levels of social disadvantage and rising crime, with the goal of breaking the cycle of imprisonment for Aboriginal people living in Bourke. For more than 25 years, the fellowship has provided support and services for people with severe and persistent mental health issues and their families to educate and to empower them. Since 2006, Together for Humanity has worked at local levels to ensure that Jewish, Muslim, Aboriginal and other Australians can enjoy a life free from prejudice and discrimination through a variety of programs and activities. 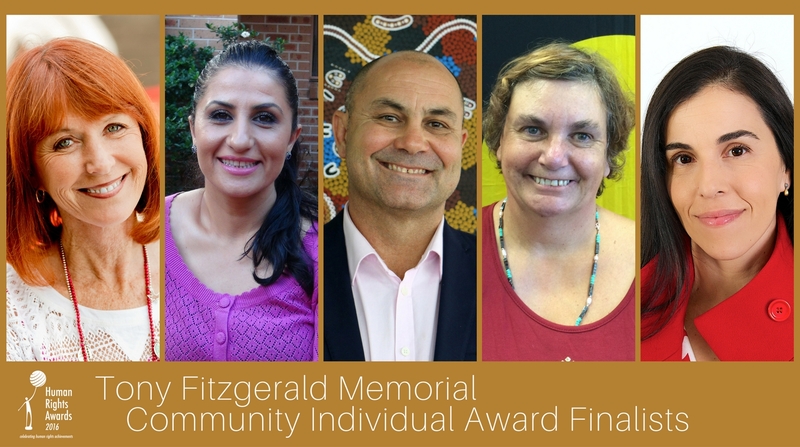 The Tony Fitzgerald Memorial Award is awarded to an individual with a proven track record in promoting and advancing human rights in the Australian community. Jane is a proud Yorta Yorta woman with an intellectual disability. She is a passionate advocate for people with disability. Jane grew up in institutions and has experienced segregation as well as sexual and other violence, including domestic violence. She contributes to several organisations and shares her personal experiences publicly to raise awareness of the abuse and discrimination facing people with disability. A revolutionary leader in the field of youth homelessness, Susan Barton is the founder and director of the Lighthouse Foundation for Homeless Youth. Susan and her team have developed a unique support model that allows complete rehabilitation into society for disadvantaged young people. Yassmen belongs to an ethnic minority called Mandaeanism who have been persecuted for many years, most notably during the Iraq War. Today, the largest Mandaean community is in Sydney. Yassmen established a Mandaean Women's committee to assist and encourage larger participation of ethnic women in the community. Catia is a disability advocate, lawyer, mum of three and the director of Down Syndrome Australia and the Attitude Foundation. She also founded the Starting with Julius project which aims to transform cultural attitudes towards people with disability, by promoting disability inclusion in mainstream media, advertising and education. Etiko is a small business that has focussed on supply chain ethics by developing an accredited and scalable ethical supply chain model. It has received an A+ rating for ethical production in fashion brands. Etiko is the first non-food brand to receive fairtrade certification in the Pacific region. Etiko’s success in promoting supply chain ethics to the broader community displays great leadership and resource commitment from a small business. It also demonstrates how doing business ethically in Australia can have significant positive human rights impacts at home and abroad. The Lendlease, Westpac and Australian Network on Disability collaboration led to the ‘Design for Dignity’ guidelines, implemented at Barangaroo Tower Two. The guidelines integrate access considerations into the building design phase, rather than have these considered as an afterthought. Colin Biggers & Paisley invests significantly in pro bono work and across the community sector. It provides critically needed legal assistance and resources to grass-roots and community-based organisations that cover a number of disadvantaged population groups. he law firm’s pro bono program is not viewed as an operational ‘add on’ but a key performance indicator for all staff. This ensures the program’s sustainability. Crown Resorts is a significant and meaningful employer of people with disability, working with disability employment service providers to actively place candidates with disability into new roles. Crown Resorts initiated the first meeting of a Hospitality Disability Business Network in Perth with the broader structural aim of improving the employment of people with disability within the sector. 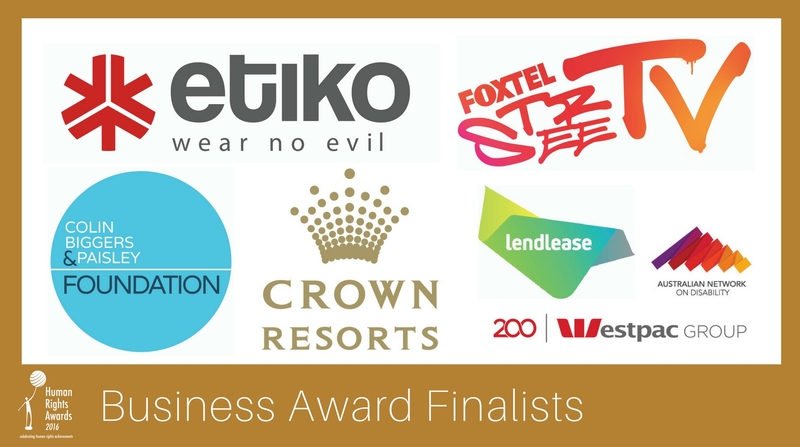 Foxtel was selected as a Business Award finalist for its Street TV program which has run for 14 years in partnership with the Salvation Army Oasis Youth Support Network. Foxtel staff have contributed many volunteer hours to train and mentor young people who have experienced trauma. This program aims to build self-esteem, restore dignity and assist young people to find their voice through the production and creation of short films which are subsequently screened on Foxtel.